We are going medieval on you! There is a musician out there that has taken an ancient instrument and turned it lose, he breathes new life and innovation into this old-world instrument. 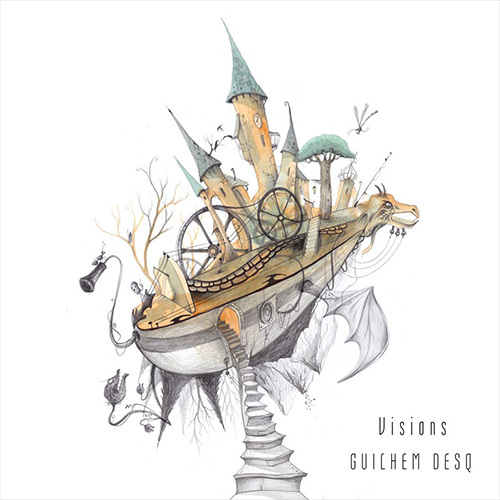 French musician Guilhem Desq, electrified his hurdy-gurdy and connected it to a sampler to create amazing sounds that seem to come straight from our century. Nicknamed the “Hendrix of Hurdy-Gurdy,” Desq has just released his debut album titled, Visions. The little-known mechanical, stringed instrument traces back to medieval Europe and has maintained a strong presence in traditional French folk music. The hurdy-gurdy is a stringed instrument that produces sound by the musician turning a hand crank that spins a rosined wheel, while rubbing against the strings. The wheel functions much like a violin bow, and single notes played on the instrument sound like a violin. Melodies are played on a keyboard that presses small wedges, typically made of wood—against one or more of the strings to change their pitch. Like most other acoustic stringed instruments, it has a sound board and hollow cavity to make the vibration of the strings audible. Desq’s sound is unmistakable as he electrifies this originally acoustic instrument and plays a wide variety of genres on it – everything from traditional European folk to Middle-Eastern, and even contemporary rock and hip-hop. That’s the short of it! Desq’s ability to get unique sounds and layer them into a musical cohesion is amazing. His music organically unfolds with layers of sounds and melodies that are always slightly colored with traditional European folk and Middle-Eastern melodic colors, but firmly rooted in today’s music vocabulary and rhythms. Desq’s compositional skills are just as creative as the sounds he is able to create. He builds musical stories and creates interesting forms for us to enjoy. The various styles and textures keep the music moving forward and it is easy to forget that everything was created on one instrument, simply amazing, but also highly musical!